Camp clothes are kept in a Sea air Sports compression dry sack. Stowed in the front hatch of the Ikkuma. I. Non cotton underware 5 pr. Note: Camp thermals were shipped back from end of Mississiippi river and replaced with North Face base layers from paddling clothes to reduce redundancy. Fowl weather and backup clothes. Kept in Sea air Sports dry bag stowed in rear hatch. Note: Fleece paddling shirt will be swapped with rash guard when weather warms. Note: With these three items I was able to handle the winter portion of the trip without too much trouble. I did wear my Kokatat boots when I had to shovel snow out of the truck in Wisconsin. A breathable version of the waterproof sock would make this system even better. 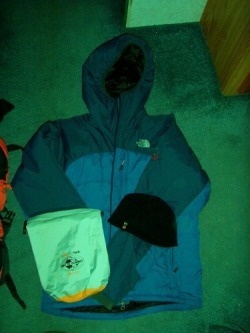 North Face synthetic fill jacket. This jacket quickly became one of my favorite bits of gear. I don't think the cold weather portions of this trip would have been as tolerable without it. The day I wear this one out it will be immediately replaced.